For use in industrial applications where a simple, robust and easy to use breathing apparatus is required, the Drager PAS Lite Self-Contained Breathing Apparatus (SCBA) combines reliability with comfort and performance. Lightweight yet robust, this pneumatic gauge SCBA offers excellent service life as well as being easy to maintain. Throughout industry, breathing apparatus is relied upon to perform reliably and consistently in a wide variety of workplace environments. The Drager PAS Lite has been developed to meet the fundamental needs for self-contained, supplied air complete with carrying harness in industrial and industrial firefighting applications. Light in weight, it is comfortable to wear, easy to use and ensures reliable performance. Requiring minimal training, the simplicity of its design also offers significant benefits to those who do not wear breathing apparatus on a regular basis. ADVANCED TECHNOLOGY - With a proven design and using the same high quality pneumatics as found in professional firefighter breathing apparatus, the Drager PAS Lite ensures consistent high performance and reliability over the lifetime of the apparatus with minimal maintenance. The carrying system features an ultra lightweight, high strength carbon composite space-frame having excellent impact, heat and chemical resistance, as well as outstanding durability. EFFICIENT LOAD DISTRIBUTION - Incorporating new materials that are shaped and formed to provide maximum comfort at both the shoulders and the waist, the carrying system has been developed to reduce back strain, stress and fatigue. 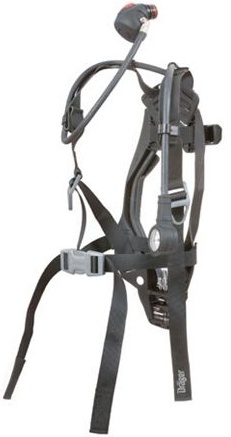 The innovative harness design ensures an excellent weight distribution at the shoulders. The inclusion of durable rubber coated fabric provides excellent wearing comfort and chemical resistance, whilst also performing well during the flame engulfment test in line with EN137 Type 2. INTEGRATED HOSE DESIGN - Both the air supply and gauge hoses are mounted into the space-frame, thus reducing the risk of snagging and entanglement. This enables the user to change the hose position from one side to another to suit individual preference. The fully integrated hose design also means that hoses can be replaced easily and cost effectively. SERVICE FRIENDLY - A number of unique design features ensure that downtime and costs are kept to a minimum during repair and maintenance. All major components of the Drager PAS Lite are quick and easy to assemble and disassemble, including the harness which is attached to the space-frame by a simple single-piece retention method. The reducer is contained in the space-frame for added protection and can easily be removed with simple tools. The harness is also highly resistant and impervious to chemicals, making decontamination and cleaning a simple, straightforward task. PROVEN, ROBUST AND FLEXIBLE - In line with other Drager breathing apparatus, the Drager PAS Lite allows users to take advantage of the tried and tested systems that lie behind the best breathing apparatus in the world. Developed as a result of years of research and extensive user consultation, these benefits include the use of the same advanced pneumatics as used in the whole professional firefighting range of Drager. The Drager PAS Lite can be further adapted to suit specific industrial applications. As well as standard fit easy to clean harness, integrated Lung Demand Valve (LDV) and pneumatic gauge complete with high pressure whistle warning unit at the base of the space-frame, electronic monitoring (Bodyguard II) or airline ready options such as the Drager PAS ASV can be specified. Integrating easily with all Drager PAS Airline equipment, this flexible breathing apparatus is also fully compatible with Drager Panorama and FPS 7000 Face Mask ranges. Our SCBA is designed for use with single steel or carbon composite cylinders rated at 4 to 9 L, 200 and 300 bar. A number of secondary supply connections are available for use in rescue, decontamination or airline applications. The Drager PAS Lite can also be fitted with a variety of electronic voice communication options.